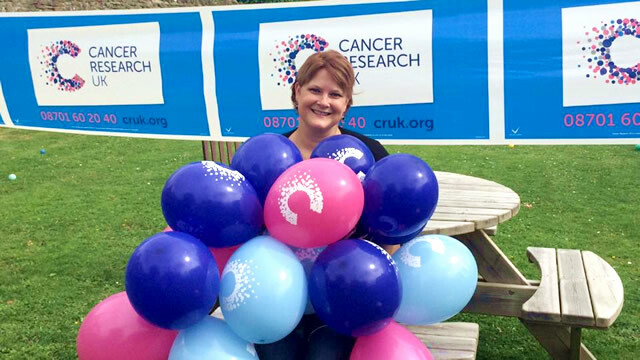 Winky Kicks Cancer Week organisers Kate Freeman and Tracey Seager kick off the week on Monday 4th August to raise money for Cancer Research UK (scroll to the bottom for the full programme, and find all the activities listed and detailed on the Calendar). Kate Freeman (38, sole proprietor of a cleaning company) and Tracey Seager, (46, Sales and Customer Service Trainer), both from Wincanton, decided to support the charity again this year after a very successful fundraiser in 2013, raising over £3,500. They wanted to make it even bigger and better and have set themselves a challenge to raise £10,000 this year. Wincanton businesses and pubs have got behind this fundraising week, with everyone playing their part by organising events or raising awareness during the week. 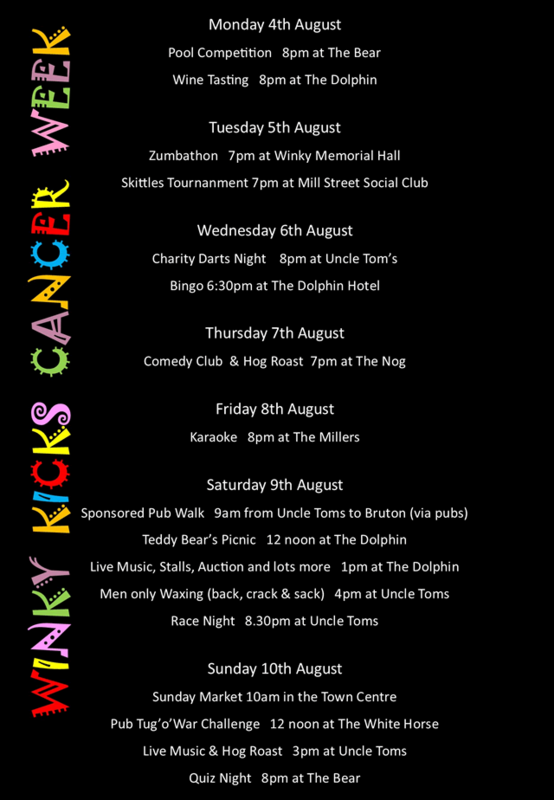 Winky Kicks Cancer Week is packed full of exciting fundraisers startingon Monday with a pool competition at The Bear and wine tasting at The Dolphin. On Tuesday 5th August there’s a Zumbathon at Wincanton Sports Centre and Skittles tournament at Mill Street Social Club. Then Darts Night at Uncle Tom’s and Bingo at The Dolphin on Wednesday 6th, followed by Comedy Club and Hog Roast on Thursday 7th at The Nog and on Friday 8th a Karaoke at The Millers. The weekend starts off on Saturday and is also jam-packed full of exciting activities, kicking off with a sponsored pub walk at 9.00am from Uncle Toms to Bruton, Lots of people have already signed up for this one, there is still plenty of spaces if you want to take part! For the younger members of the community come along to our Teddy Bears' Picnic at the Dolphin, where you can stay and while away the hours shopping at an array of stalls and listening to live music, which will continue into the evening. If there are any brave men out there you can take part in the “Men Only” waxing fundraiser at Uncle Toms followed by a Race Night for all you budding jockeys. This exciting week comes to its climax on Sunday 10th August with a Street Market in the town centre, Pub Tug of War challenge, Live Music and Hog Roast and Quiz Night. “We are delighted that Kate and Tracey are organising, what looks to be an exciting week of activities. They are an absolute inspiration and we can’t thank them enough for all they are doing to raise funds for Cancer Research UK. It’s thanks to support like this that Cancer Research UK’s doctors, nurses and scientists are able to go on making progress in the fight against cancer. For further information about the weeks activities, or to book you place on the walk please contact Kate Freeman on 07727 043381 or Tracey Seager on 07712 482524.